Navigation Tip: Click on blue text that’s italicized, underlined and in bold for link to more information. We hope that you’re doing well and enjoying more sunshine, blue skies, and warmer weather! Article titles for PROSTATE CANCER NEWS YOU CAN USE are listed below along with a link to the Us TOO web page that provides access to the full text for each article. 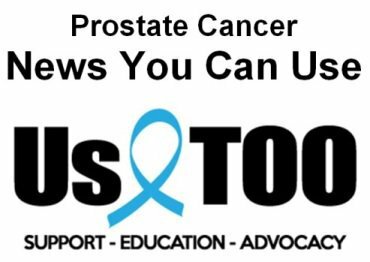 Us TOO is proud to be an advocacy partner with The Metastatic Prostate Cancer Project ( MPCproject.org ) , a nationwide genomic research study for men with metastatic and/or advanced prostate cancer. Patients can join online and participate by sharing their medical information and samples. The project’s first data release included de-identified clinical, genomic, and patient-reported data. The goal is to release new data every six months at MPCproject.org/data-release to help researchers better understand metastatic and advanced prostate cancer, and accelerate discoveries. Prostate cancer support groups provide a valuable opportunity to connect with others for solutions, support and perspective on managing every aspect of the disease – from testing to active surveillance, treatment options and side effect management. Us TOO has a network of more than 200 support groups in the U.S. and abroad. We thank all of the support group leaders who volunteer their time and leadership to provide this peer-to-peer forum for men diagnosed with prostate cancer and their loved ones, and encourage those who are interested to find an Us TOO support group near you . If you are the wife or female partner of a man with prostate cancer, we invite you to join a conference call to connect with other women facing the same challenges. Because prostate cancer is a couple's disease, the woman is often subject to her own concerns in addition to those she shares with her partner. A Forum for Her is an ongoing series of conference calls that provide women with important peer-to-peer support. To register email terril@ustoo.org or call 877-978-7866 . Change Together recently featured a post from Us TOO . Content addresses sexual health, urinary incontinence and the psychosocial impact of prostate cancer . On June 8, The California Prostate Coalition and UCSF Helen Diller Family Comprehensive Cancer Center will present The 2019 Patient Conference on Prostate Cancer in San Francisco. Register and get more information . Please note that the content below lists only the title of the article rather than a direct link to the content. For access to the full article CLICK HERE . New clinical data analysis shows survival benefit three years after treatment with Sipuleucel-T. Data presented at 2019 ASCO Genitourinary Cancers Symposium underscore an even greater survival benefit for African-American men treated with immunotherapy ( read press release) . Let us know how we can help provide you with educational resources, support services and personal connections to others in the prostate cancer community. Take care, enjoy the spring season, and watch for the April 2019 issue of the Us TOO Hot SHEET newsletter coming soon.